Great-grandmother Dorothy Hopkins received the most horrific Mother's Day card of all time. Other obscenities, scrawled in black marker pen, screamed out 'w***e' and 'b****,' leaving the mother-of-six in total shock. 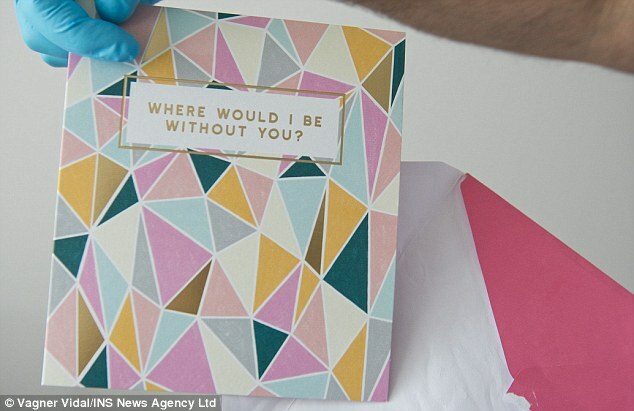 Today an investigation had been launched by the Royal Mail after it became clear the Mother's Day card from Dot's loving daughter had been intercepted by someone at the postal sorting office, with the company saying the culprit could face criminal prosecution. 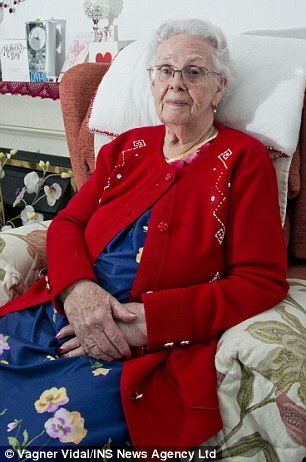 'I am so shocked, I haven't been able to bring myself to read the message fully,' said Dot at her home in Woodley, Berkshire, today. 'It is an absolute disgrace. If it was someone's idea of a joke, it was in terribly bad taste and has left me really upset. I have six children, eight grandchildren and 14 great-grandchildren and I was really pleased to receive six Mother's Day cards - but I can only put up five because Mandy's has been defaced by someone at the Royal Mail. 'We have been in touch with the police and someone senior from the Royal Mail is coming to see me tomorrow,' he added. The mind-blowing Mother's Day card dropped on Dot's doorstep on Saturday morning and she was surprised to see that it was already open and that the envelope was torn. 'My grandson Steven Billington was at my house and after seeing the horrible message written inside, he chased after the postman who delivered it and confronted him with the envelope. The postie took photos of it on his phone and reported what had happened to his bosses. 'It must have been someone at the sorting office who opened the card and wrote the disgusting message. They even signed it as from 'the loving sorting office',' said Dot. Dot revealed that daughter Mandy had posted the greetings card to her from a postbox in Dorset on Friday before it was delivered on Saturday morning. 'Steven sent Mandy a picture of the defaced card and she was terribly angry and upset. The whole episode has cast a nasty shadow over Mother's Day. It may have been a prank but it is not funny and very distressing. I didn't sleep last night, worrying about it,' she added. Daughter Mandy vowed to find out what had happened to her card. 'The Royal Mail staff are the only ones who handled the card before it went through my mother's front door. It's a bit disgusting - she is 85 years old. 'She shouldn't expect to have that sort of thing happen to her. There are six of us children and it's not every year she gets six cards. Now there is one she can't proudly display. 'The postman was taking photos of the offending card and apologising and saying he would contact the manager. But that's not good enough. We are not just going to accept an apology or whatever. I am so so angry,' she added. 'I just don't get the mentality of someone who can do that. And who knows, my mother's card may not have been the only one. Others might be opening their cards today and finding similar disgusting messages. 'To write all of that and to scribble out 'love' and put 'hate' instead - it's just not right really. A Royal Mail spokesperson said: 'We are very sorry to hear about this and the understandable distress that it has caused Mrs Hopkins. A representative from the company will be visiting Mrs Hopkins today in order to apologise in person for the incident. 'We are urgently investigating what has happened. It is a criminal offence to tamper with mail and anyone caught doing so will face serious disciplinary action. 'Royal Mail will always seek to prosecute the tiny minority of people who abuse their position of trust. The integrity, safety and security of mail is of the utmost importance to this business.